Depending on your needs, PVC plastic is often an ideal replacement for wood as your primary material. This type of material is commonly known as PVC decking; plastic decking; eco-plastic decking; or even sometimes recycled plastic decking. It is usually made only from Polyvinyl Chloride (PVC). While it is similar in characteristics to composite decking, the two materials are different as this type of decking is made purely from plastic & contains zero wood. However, it is made in a similar way as with capped composite decking. Using a difficult process known as co-extrusion, plastic moulded into the shape of boards is coated with an outer shell. Production is not easy and many manufacturers struggle to get the coating the right width. So much so that a high number of boards produced are usually deemed unsuitable & scrapped by manufacturers before they even reach the consumer. Before you buy, read our expert facts & opinions so you know exactly what you’re buying. Choosing the right type of boards to match your needs is so important. As with composites, this material is ideal for those looking for minimal maintenance requirements. Because it’s made from a synthetic material, as soon as it has been laid, there’s very little else needed in looking after it. Its outer coating also means that any stains & dirt can be cleaned with ease. Unlike wood, plastics don’t rot & aren’t attractive feeding grounds for mold & fungus spores. They’re also resistant to insects & won’t split or warp under extreme weather conditions like wooden structures. Similarly, they are protected against UV exposure which helps to limit any fading or loss of colour. This means that these decks often have an extremely generous lifespan, lasting anywhere up to 4 times as long as wooden structures. The various benefits of this decking material do come at a cost. Board-for-board it is almost always more expensive than softwood/pressure-treated decking. Often it’s similarly priced (if not more expensive) than WPC composites & tropical hardwood types such as Cedar or Redwood. Detractors also complain that plastic decking can look very artificial & doesn’t have the same organic look & feel as soft or hard wood types. However, manufacturers have definitely improved upon this over the last few years and nowadays it can be difficult to tell the difference between the two. Top Tip: PVC decking is known to become incredibly warm underfoot. 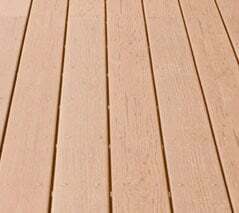 If you live in a sunnier climate & your decking is likely to be fairly exposed to the sun, it is recommended that you choose a lighter shade of plastic. Dark colours will likely make it impossible to walk on your deck bare footed in the summer months. Because of their ability to undergo extreme wear-and-tear, plastic decking boards are generally recommended for structures likely to experience high footfall. They can also be beneficial in high moisture environments or climates where temperatures are known to swing wildly from one extreme to the other. This decking is almost always installed using a hidden fastener system. These are generally screwed into the supporting joists & completely hidden from view. There are a number of unique fastener systems out there which would likely be suited to your build such as CAMO. A high quality fastener system will pay for itself in time. It is also possible to ‘face fasten’ your boards using stainless steel or zinc screws. It’s advisable to pre-drill these. Top Tip: while wooden boards are likely to shrink after installation, with this type of decking it’s important to leave necessary gapping for the boards to expand. Generally it’s recommended to leave between 0.5-1cm of spacing between boards. Longer boards generally experience a greater amount of expansion than shorter boards. You should also remember that because plastic decking is not as strong as its wooden counterpart, it is only suitable for low-load structures. If you’re expecting your deck to support heavy loads, you either need to use a tougher material or ensure that your supporting joists are properly equipped to support PVC boards. Plastic materials should never be used for the primary load-bearing elements of your deck such as beams, posts or joists. These are generally made from pressure-treated timber. The main benefit of PVC (and the main reason many choose it for their deck boards) is its low-maintenance appeal. Because the material doesn’t split or warp; fade or rot; expand or contract (at least not to extremes!) – it is very easy to maintain & often lasts years with minimal maintenance requirements. It’s important not to over-expose this type of decking to excessive sunlight. In extreme heats, it has been known to sag and discolour. Some chemicals in sun tan lotion & insect repellent can be known to react badly with the plastic material & cause stains or fading. Promptly remove this if it comes in contact with your deck. Rubber-backed garden furniture should be avoided too, as this is also known to cause discolouration of the decking surface. Plastic decking can sometimes be prone to a build-up of static & may cause electric shocks from time-to-time. Unfortunately this can’t be combatted through your general maintenance. However as the deck ages, a natural build-up of dust & rain should help to discharge any build-up. Though it is low-maintenance, you should still aim to clean your deck at least once a year to combat any build-up of dirt or other organic matter. Plastic decking should be cleaned in much the same way as composite decking. It’s important never to use bleach on your surface as the Chlorine may discolour the boards. Pressure washers or plastic deck brushes are perfect for this decking & either may be used. Both are great at removing stubborn stains & dirt without causing scratches or damage to your surface. There are decking cleaners out there which have been specially produced for plastic PVC & composite surfaces. You should be able to find these in your local DIY store. See our cleaning guidelines for more info. Although PVC decking is made from a by-product of petroleum refinement, it is often thought of as one of the main eco-friendly products to build your deck from. Because the structures last an awfully long time, they need replacing much less frequently than less durable materials such as pressure-treated softwoods. In fact you might need to build 4 iterations of a pressure-treated softwood deck in the same period that one PVC deck might last. These boards are often made from old recycled plastic products such as supermarket carrier bags. This is ideal environmentally because not only can new boards be made from recycled materials, but the structure can be melted-down and re-used again once the deck is removed or replaced. Any off-cuts or un-used pieces can also be recycled immediately after the build. This is something which is not possible with composite materials which, once mixed, cannot then be recycled. Top Tip: For those eco-warriors looking for an uber environmentally-friendly deck; look out for boards which contain at least 50% (or more) post-consumer waste plastic. This will reduce the amount of virgin plastics used in your build & reduce your environmental impact. The only down-side to this material is that Polyvinyl Chloride doesn’t have the greatest environmental reputation. There have been several studies outing the potential negative effects on health of PVC additives; though only through mouth or liquid contact – rendering it completely safe for garden decking. And because the manufacturing & disposal of PVC causes emissions (and carcinogenic fumes when burnt), it is by no means the perfect environmental solution.